Use a whisk or fork to blend the flour and baking soda together in a medium size mixing bowl. In a large mixing bowl, use a large spoon (preferably wood) to cream the margarine and sugars together until light and fluffy, then add the eggs and vanilla. Blend thoroughly. Add the flour and soda mixture and chocolate chips to the large bowl and mix until the chocolate chips are evenly distributed. Drop globs of dough onto an ungreased baking sheet, about 1 heaping tablespoon per cookie, or a bit smaller than a ping pong ball. The dough will flatten and spread as it bakes, so leave about 8 cm. (4 inches) between globs of dough. A typical baking sheet can hold 12 cookies. Bake for 8 to 10 minutes, or until golden, with LIGHTLY browned edges. 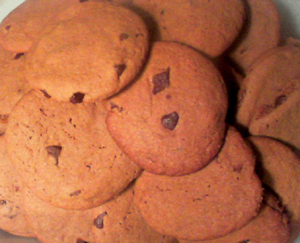 It is important not to overcook the cookies; they will look almost under cooked when removed from the oven. immediately and allow to cool on a rack. Leaving them on the hot baking sheet will overcook the bottoms.